Well, Sarah, I’ve grabbed my handy dandy books, researched the differences and science behind baking a successful sponge cake, and I’m here to rescue you from your falling sponge! 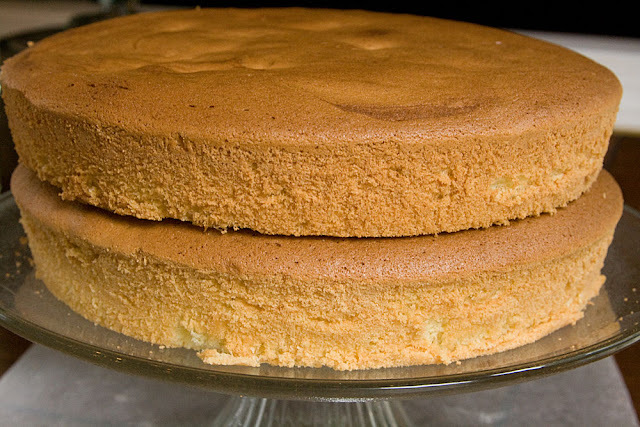 Let’s start with the basic question; What is a sponge cake? To answer the question of the difference between an Angel Food Cake and a Sponge cake, an angel food cake requires the use of only the egg whites and is considered a fat free cake, whereas the sponge cake uses egg yolks and hence has a low level of fat to it. 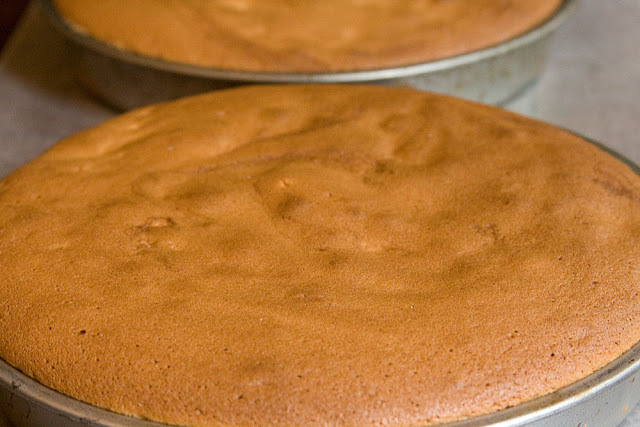 Tip number 1: When making an Angel Food Cake, cool the cake upside down (open end down) and leave the sides of the pan ungreased as the cake needs to cling to the pan when baking in order to rise. 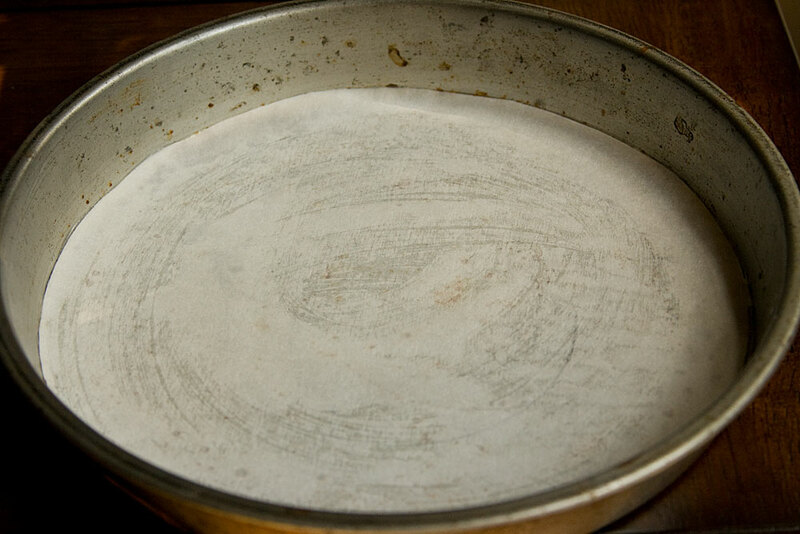 If you grease the pan, you stand a good chance of inhibiting the rise. If your pan doesn’t have feet, consider placing it either on a bottle or a small oven grate to elevate it a bit off the counter as it cools. Ok, let’s get started with the baking of the sponge and I’ll add in tips and tricks as we go along. The first thing you want to do is grease up your two pans and line the bottom with parchment paper. 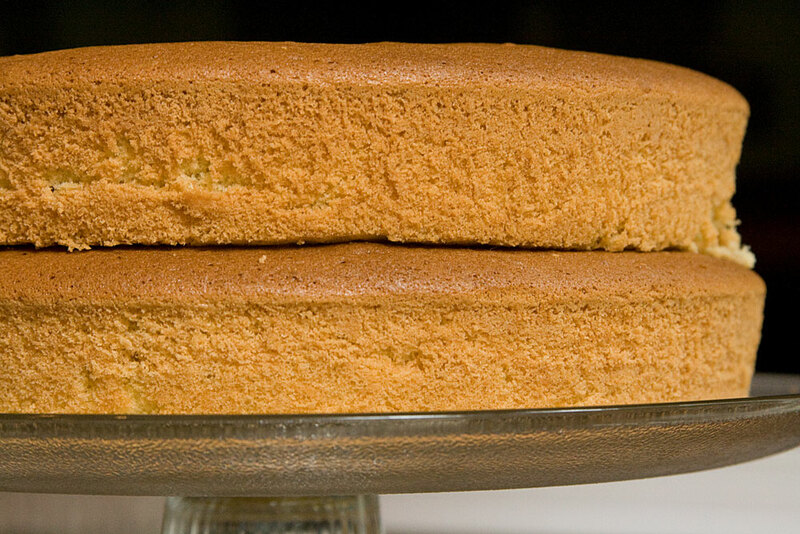 Tip Number Two: When baking a sponge cake, never grease the pans with butter, always use shortening. 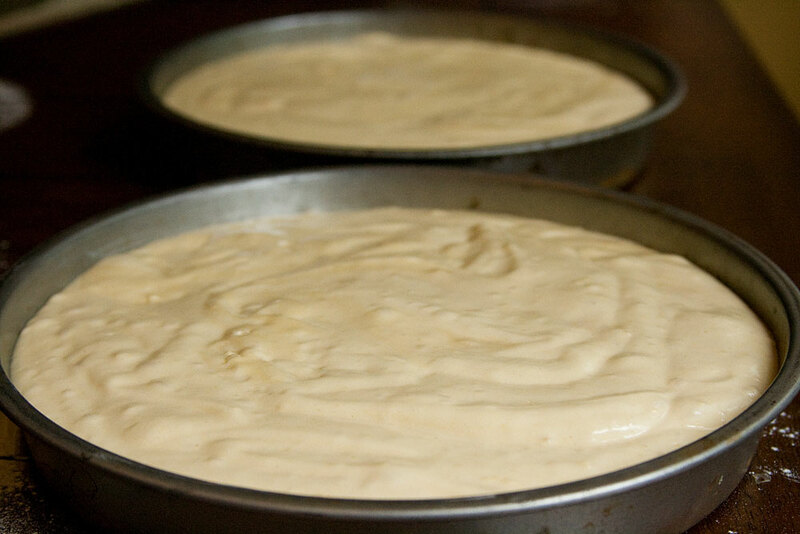 Butter has a high water content which can make the cakes soggy. Now you’re going to set the flour aside and grab your butter and vanilla. 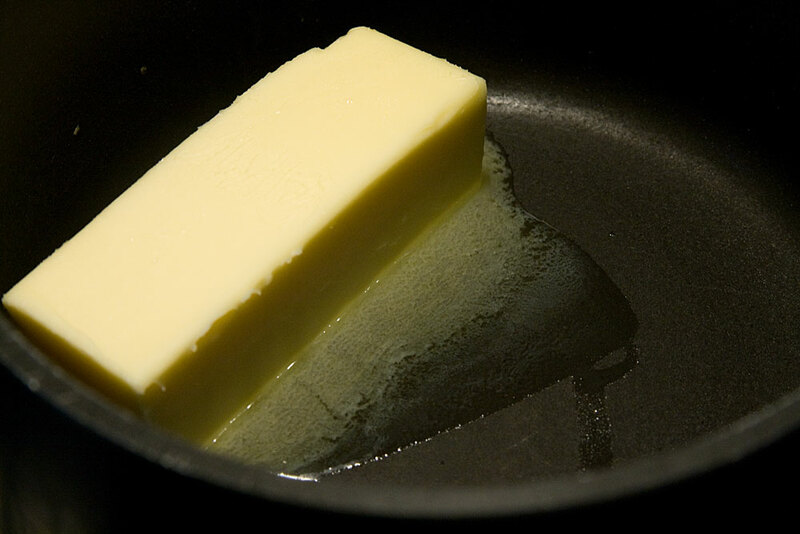 Melt the butter on low heat in a small sauce pan. When the butter’s melted, remove the pan from the heat and stir in your vanilla. Now it’s time to get to the fun part. This is where the true sponge makers are made. It’s the part that will determine whether you succeed or fail. The defining moment. What? Get back to the recipe you say? Alright, alright. We’re back at it…. well we’re back at it in one minute that is. First I want to take a quick time out to explain the different ways that we can get air into our eggs. There are three different methods for foaming eggs; cold foaming, warm foaming, and separation foaming. I’ll give a brief explanation of each one below. Cold Foaming – This is the method whereby sugar and eggs are added to a mixer and whipped up at a high speed until they obtain maximum volume. Once they hit maximum volume they are turned down to medium speed and whipped a few minutes longer before folding in the flour by hand. 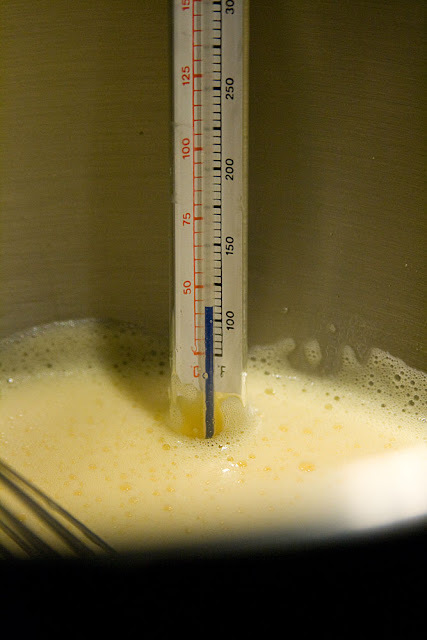 Warm Foaming – For warm foaming, you whisk your eggs and sugar together over a hot water bath until the temperature of your egg mixture hits 110 degrees. Then you transfer it over to an electric mixer and beat it up until it hits maximum volume. The advantages to warm foaming are that your eggs will reach a greater volume than with cold foaming and the heat will make your egg mixture more stable, running you a lower risk of collapse. This is the method we’ll be using for our sponge cake. Separation Foaming – In this method, the yolks are separated from the whites. 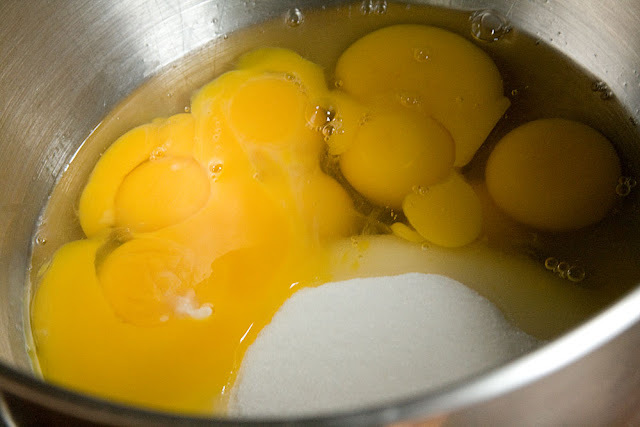 A third of the sugar is added to the yolks and they are beaten until doubled in volume. Then the eggs whites are beaten until they have soft peaks. The remaining sugar is beaten into the egg whites until a meringue forms. Finally the two foams are folded into each other. This method yields the highest egg volume of the three. 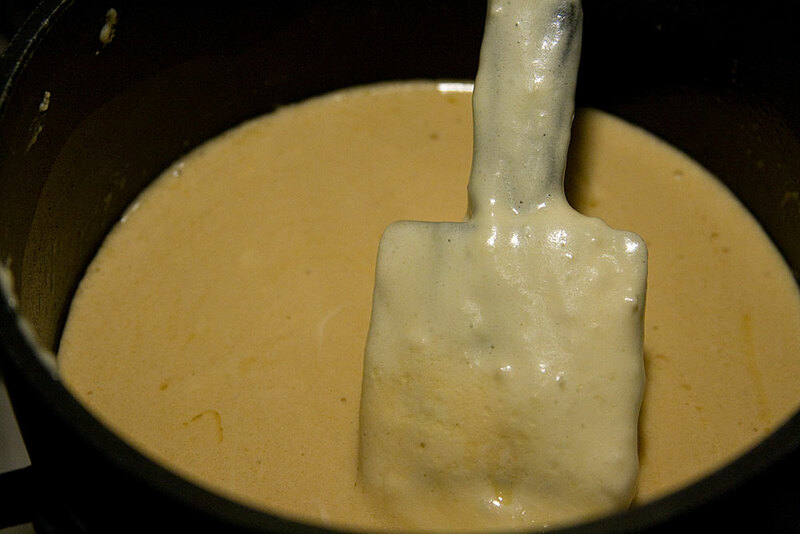 For our recipe, we’ll be using the warm foaming method. If you have a kitchenaid mixer, grab the bowl from it and add to it your sugar, eggs, and egg yolks. 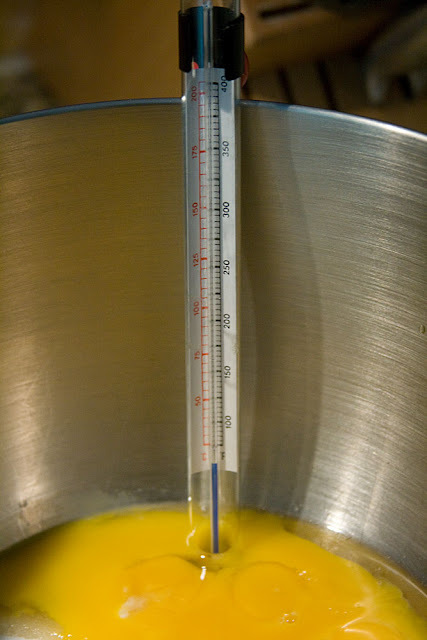 Now, while your water is heating up, grab a thermometer and attach it to the mixing bowl with your eggs. Ok, here we go. Set your bowl on top of the hot water and start whisking. You want to whisk constantly until the temperature of the eggs hits 110 degrees. Don’t stop or your eggs run the risk of cooking. I’ll warn ya, it took a good 15 minutes for my eggs to hit 110 degrees and my arms were screaming by the time I was done. It’ll be worth it though, I promise! Here’s mine telling me they’re at 110 and they need to be removed. Ok, take your bowl with the hot eggs and attach it to your mixer. Turn the speed on medium and let them foam until about 3 times in size. I let mine run for about 5 to 7 minutes. Tip Number 3: If you beat the eggs for too long on high or low speed, you can collapse the air from them. However, if you beat the eggs on medium speed you can beat indefinitely and never have your eggs collapse! Here are my eggs after getting a sufficient beating. Alright, now let’s step over to that saucepan of butter and vanilla. Grab a small cupful of your batter and drop it into your butter. Mix it up well. 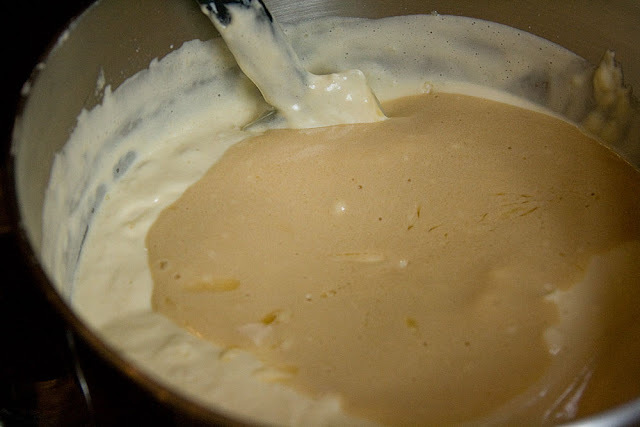 Take that mixture and put it back into your batter. Now fold it all together one last time, being careful not to release too much of the air. Pour your batter into the two prepared cake pans. And last but not least, cook ’em up in an oven preheated to 375 degrees for about 30 minutes or until a toothpick comes out clean. And was all our hard work worth it? You tell me. I’m heading out of town to Ocean City for the week so I’m bring this beauty with me and frosting it when I get there. I’ll be sure to share the final result here once I finish it! A special thanks to Sarah over at Mum in Bloom for offering up her suggestion for Beyond the Basics. If you have an ingredient you’d like to know more about, a baking process that stumps you, or any other “why do we do that” or “how does it work” question you’d like to have answered, let me know below in the comments and I’ll jump right in! 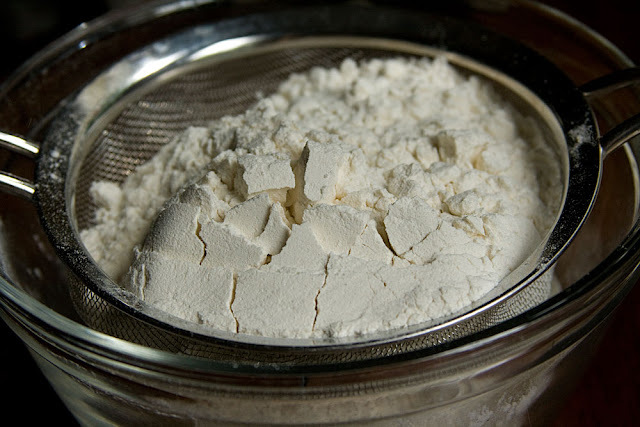 Grab your flour and a sifter and sift your flour not once, but twice. Set the flour aside and grab your butter and vanilla. Melt the butter on low heat in a small sauce pan. When the butter's melted, remove the pan from the heat and stir in your vanilla. If you have a kitchenaid mixer, grab the bowl from it and add to it your sugar, eggs, and egg yolks. 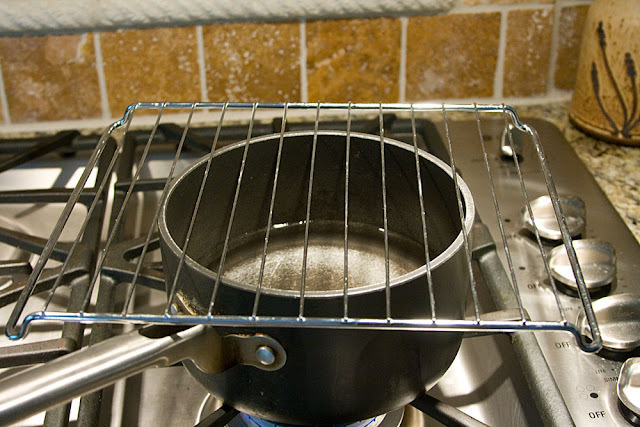 Grab your saucepan, fill it up an inch or two with water, turn the heat on medium high and find some sort of stand to put over it so you can place your eggs on top. While your water is heating up, grab a thermometer and attach it to the mixing bowl with your eggs. Set your bowl on top of the hot water and start whisking. You want to whisk constantly until the temperature of the eggs hits 110 degrees. Don't stop or your eggs run the risk of cooking. Take your bowl with the hot eggs and attach it to your mixer. Turn the speed on medium and let them foam until about 3 times in size. 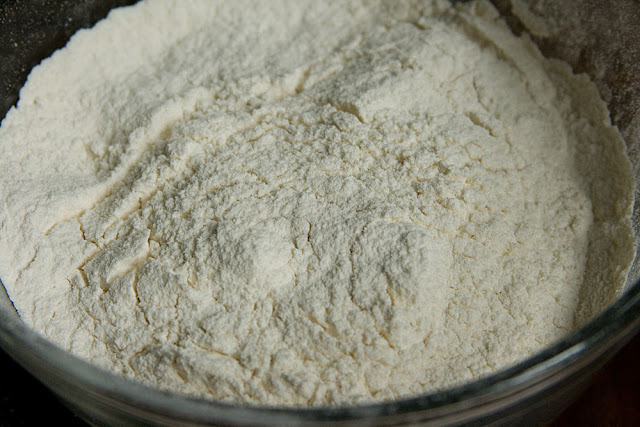 Grab the flour and fold in carefully, being sure that you incorporate the flour completely. Grab a small cupful of your batter and drop it into your butter. Mix it up well. Cook up in an oven preheated to 375 degrees for about 30 minutes or until a toothpick comes out clean. Thank you so much Julie. I took a course years ago where they taught different techniques; your direcitons by far supasses that lesson Bravo! Not easy to get a perfect sponge cake. Wonderful post! You make it sound manageable–and the recipe looks like a delightful basic cake recipe! Julie you are truely a Goddess of baking! After reading your post I realize I did about a million things wrong when I made my last sponge cake. I whipped too high, didn't sift my flour enough, used butter to grease my pans, and so many more mistakes. Your instructions are thorough and well written. I think I'm brave enough now to try again – eeeek! – and I'll link back my results. Beautiful Job! I made an angel food cake once and it was pretty darn easy and turned out really nice. I suppose I would be up for attempting this. I'll be anxious to hear your followup review once it's frosted and sliced. those step by step pictures and instructions are so helpful….I am a very visual person and seeing it really helps….thanks for the inspiration! You have the science of making a sponge cake down. Fantastic post with great photo, clear instruction and a solid recipe. I love that you're doing this series!!! I'm so glad that you have the patience for all that research. You're awesome!!!! I'm bookmarking this page for any time I attempt to make a sponge cake. This was by far one of the most informative and practical posts I've read in a while! I especially appreciated the tips about greasing the pan…I would have never thought to not grease an angel food cake pan…thank you! You know, I think I've gained 10 pounds since becoming bloggy friends with you. Are you headed for Ocean City, MD? That's in my neck o' the woods! So amazing! I love all the research and work you put into this. I'm loving this series. If you ever get a chance to do a "wet cake" I'd be thankful. For some reason wet cakes, like tres leches cake, never work for me! They never soak up all the milk. I've made 2 tres leches cakes (different ingredients) and another wet cake and both of them were dry in many places and didn't grab the milk. Thanks for taking the time to explaining the how and why. I love it. I started to read this post three times and finally got to finish! Thanks for the tips. They will come in handy. Thanks Julie – this does help. I didn’t know about not greasing the sides so the cake can be held up. I did put it upside down after cooking. Another factor – I always make it at Passover when I can’t use flour – I have to use ground up matzo meal. So I should try your recipe and see how it comes out with your tips and then see what happens when I am restricted to not use flour. Could be that’s also part of the x-factor. However the recipe I use is from a great Jewish baking cookbook so I suspect it’s me and my technique, not the ingredients :-). Really interesting tutorial about the different way to beat the eggs. The recipe I use calls for separation and separate beating with sugar as you mentioned. Well, thanks to you and your amazing blog I now want cake. I really like how you describe each step beautifully and make it look like any of us novices can do it. Plus, your photos are outstanding! Congrats on your SITS Girl in the Spotlight Status! I love easy, step-by-step, fool-proof instructions. This looks delicious. Thanks for sharing and congrats on being featured over at SITS! hi,im new on ur site. I would like to ask,how can i know if my egg mixture hits 110 degrees since i dont have a thermometer?will i just touch and feel if the sugar have fully dissolved.? wow thank you for ur great,very informative site!! Great post. Luv luv love the fabulous tips. Never heard about the cold, warm and seperate foaming techniques. I also love the tip about the egg temperature being 110°. Thanks a million. God bless. Thank you so much, Julie. I was looking up the science of sponge cakes in preparation for tweaking my own schwarzwalder kirschtorte recipe, and your article really put things in perspective! I really love that you take the time to explain the principles behind your techniques. It is so frustrating hearing people offer advice about cooking without really knowing what they are talking about. I was wondering about the use of baking powder with egg stabilization. I know that the sugar helps, but would baking power also help, not really do anything at all, or would it be a hindrance to stabilizing the eggs in the recipe? Or do the different types of preparations of the eggs eliminate the need for baking powder? I know this article is over a year old, but I would love to hear your advice on the matter. Hello! How much flour do I have to subtract and how much cocoa powder do I add if I want to make a chocolate sponge cake? Wonderful recipe….. can it work with no baking powder/soda added??! having had one too many sponge cake disasters with Passover, I did some research and found your recipe and technique. Looks good. Since egg size varies from place to place, who much egg do I need for this recipe? in US cups or mls, please. thanks for sharing all this info. Troubleshooting at its best and the photos are very helpful. Patty, I used 9″ rounds. I’m not sure about the 12″ round as I haven’t done that before but you could definitely give it a try! Seems too much sugar to me. Actually, your recipe uses more yolks. Is it possible to use more egg white (beaten separately)? Will the cake be lighter? Honestly, I haven’t seen this technique before. Did the eggs cook in the shells at all when they did it? My main concern would be that you don’t want the eggs to solidify which is why you constantly whisk as the temperature heats up. 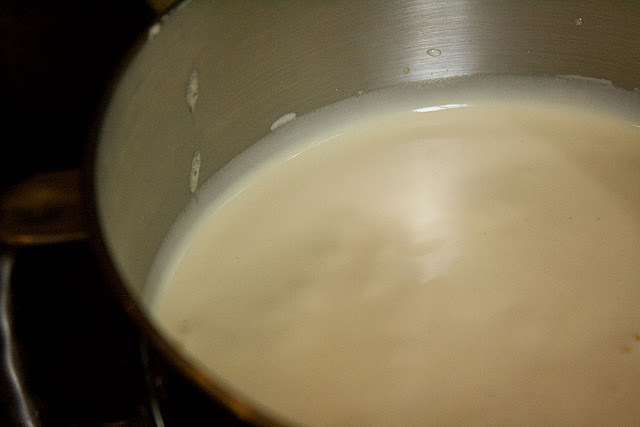 You also want to have the sugar dissolve and this happens when the mixture gets warm as well. Definitely interesting. If you decide to try it, let me know how it turns out! Awesome! I must try your recipe. My sponge cake came out like just normal cake. Can I use margerine instead of butter? 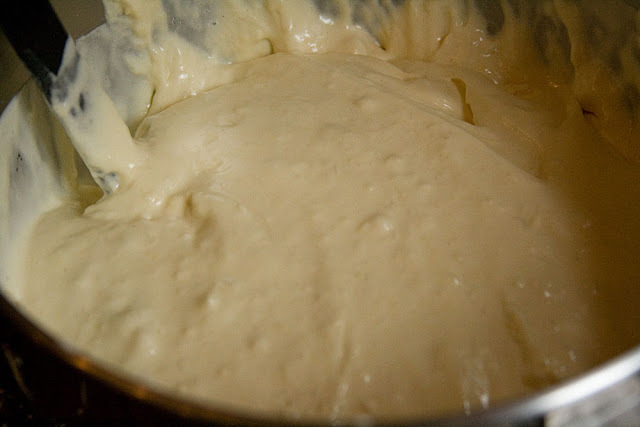 I only managed to make batter enough for a single 9″ tin. I wonder where I went wrong. I took care to follow all the steps the entire recipe. Can you please confirm the quantity of sugar ? Can you please confirm if powdered sugar can be used? I remember the volume going down when folding in the sifted flour into the egg and sugar mixture. Any advice on how to avoid this? can I get the recipe in Grams?